Your Villans are ready to hit the road for the 09/10 Premier League, FA Cup, Carling Cup and the new Europa League. And this snazzy white shirt is the one they'll be favoring. 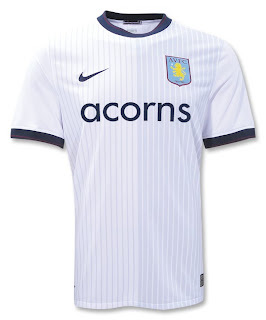 Introducing the Aston Villa 09/10 Away Soccer Jersey from Nike. From the first capped players in 1882 to other club legends like Peter Withe and Brian Little, Aston Villa have provided more England internationals than any other club. Thus Aston Villa and Nike drew inspiration from the archives about Villa’s contribution to international football for this new shirt. It features a 'football white' color with a 'Villan red' trim; the club's mantra 'Prepared' is engineered into the side-seam of the shirts while also being present on the Villa crest. Made of Nike's Dri-Fit, an innovative technology that draws sweat away from the body to the fabric's surface for fast drying, while its three-dimensional construction allows for more air space around the skin to reduce clinging, all of which enhances the performances of players by keeping them drier, cooler and lighter. Looking to the future: Nike has used the latest sports apparel innovation and technology to help the current crop of players take their game to the next level. The visual design of the jersey is intended to reflect the personality and style of the current Villa team (which often fields nine English born players and currently has five regular England internationals) while respecting the history of the club. Leo Sandino-Taylor, Nike UK Head of Corporate Communications said: "Aston Villa has some exciting English players in their squad who could make a real contribution to international football in the next few years. Their current success with the National team has provided the perfect opportunity to pay tribute to the club's England connections and create a technologically innovative kit that Villa fans and players will be proud to wear."